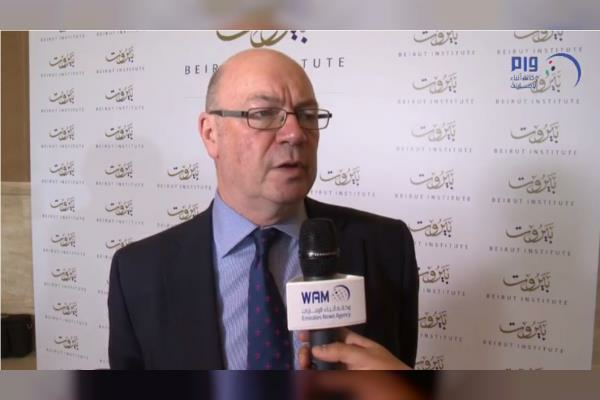 ABU DHABI, 13th May, 2018 (WAM) -- Alistair Burt, Minister of State for the Middle East and North Africa Affairs of the United Kingdom, praised the efforts of the UAE and Saudi Arabia to deliver humanitarian assistance to the Yemeni people. He also confirmed the UK's support for improving the political solution in Yemen and ending the suffering of its people, while those activities that undermine the stability of the region's countries, such as Yemen, are dangerous, and the UK's position is a clear rejection of violence and extremism. He added that the UK will continue to work with the UAE and its partners in the region to counter these dangerous activities, which threaten international peace and security. While answering a question about the issue of ballistic missiles and their threat to the safety of the region's countries, Burt stressed that there are two factors related to this issue. The first is the United Nations resolution on ballistic missiles and the smuggling of weapons to Yemen, while Iran was placed under the spotlight regarding this issue. The second is related to violations against international law, including weapons smuggling to the Houthi militias. Regarding bilateral relations between the UAE and the UK, Burt said that relations between the two countries are strong and important, involving cooperation in many areas, such as the economy, investment, security, sports and culture. He further said that both countries are working to establish peace and stability in the region, while noting that the UK is a partner and supporter of the "HEDAYAH Centre of Excellence for Countering Violent Extremism" in Abu Dhabi. While answering a question about his participation in the summit, he explained that the summit is being held at a sensitive time for the region, and is a platform for gathering many relevant parties to discuss important regional issues. Burt congratulated the UAE on the occasion of the Year of Zayed and its celebration of the centennial anniversary of the birth of the late Sheikh Zayed bin Sultan Al Nahyan, while highlighting the deep ties between the UAE and the UK.